At first glance, most people dont see the connection between chiropractic and pregnancy. However, there are four stages in which having an optimally working nervous system can help both mother and child. Our pregnant patients often report shorter, more pleasant deliveries when they receive chiropractic care. Chiropractic care prior to conception promotes a more regular menstrual cycle and optimal uterine function. It prepares the body to be as strong, supple and as balanced as possible to carry the pregnancy. Regular chiropractic care helps maintain uterine ligament flexibility and balance. When the growing baby is comfortable it can assume the optimal birthing position. Mothers who get adjusted during the birth process seem to require less intervention. When the mother remains supple, the baby can move more easily through the birth canal. Even natural births can stress a babys spine. Breastfeeding problems can arise if the baby has a subluxation and is unable to comfortably turn its head to one side. Having a more normally working nervous system, especially when youre pregnant, creates the optimal environment for your baby to realize his or her fullest potential. Of course not. This is a common concern among parents who mistakenly think their child will receive adjustments like the ones they receive. Not only are adjusting techniques modified for each persons size and unique spinal problem, an infants spine rarely has the long-standing muscle tightness seen in adults. This makes the energy needed to adjust a childs spine considerably less than an adults does. No. Only the spinal joints that are locked up receive adjustments. This allows weakened muscles and ligaments to stabilize and heal. Being born is a natural phenomenon. Its what weve done to the birth process that has become increasingly suspect. In hospitals, birth is often treated like a disease. A newborns introduction to the world is often accompanied by a severe drop in temperature, loud noises and other insensitivities. The administration of drugs and anesthesia can have a profound effect on a newborn. First, you dont need anyones approval to seek a chiropractic opinion about health issues affecting your child! The judgment of another health care expert is always helpful in the decision-making process. Medical practitioners keeping up with the latest pediatric chiropractic research are starting to understand the value of this natural, drug-free approach to better health. 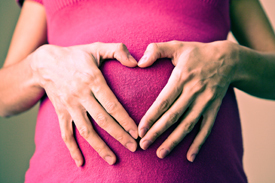 Pregnancy may be one of the best times to receive chiropractic care! While its always good to have an optimally functioning nervous system, its especially helpful now. Both mother and baby can benefit. Adjusting methods are adapted to a mothers size, weight and condition. During this period of weight gain and hormonal changes, many mothers seek chiropractic care. Many report shorter and easier births.